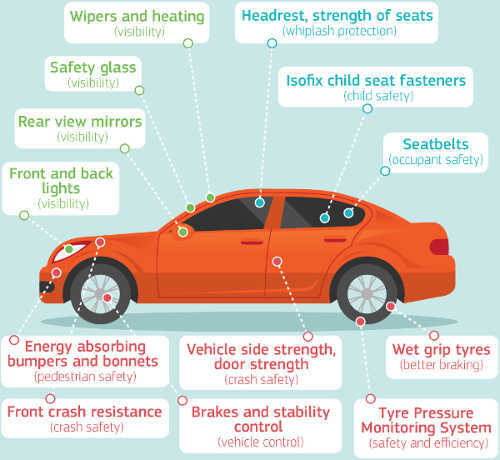 The European Commission has published a list of 19 lifesaving safety technologies that could be made mandatory on new vehicles in the next update of EU vehicle safety rules expected next year. The report presents workable and cost-effective car safety measures. The main objectives are to decrease the number of road victims and to help prevent accidents. As vulnerable road users, special attention was given to children and the elderly. All the safety measures outlined in the Commission report will be followed by an impact assessment that will contain a cost/benefit analysis and will include a public consultation and a stakeholder debate. Depending on the results of the consultations, the Commission will consider the following steps. The Commission will then move forward on the measures that are seen to produce a clear benefit. The European Transport Safety Council (ETCS) welcomes the announcement but says several critical areas for action are missing, and the proposed timescale is far too long considering that most of the technologies are already available. ETSC says 26,000 people die on European Union roads annually, with at least 135,000 suffering life-changing injuries. Progress on reducing these numbers has been dramatic over the last two decades, but has slowed to a halt and even gone into reverse in some countries in the last two years. Improved vehicle safety standards are critical to reducing deaths and serious injuries, but the EU’s rules have not been updated since 2009. EU Press Release; EU Report; ETSC Press Release.